Transfer images at the touch of a button, renaming and storing them with file and directory names you choose. NeatImage users can use the ISO value to download images into separate directories according to the ISO value making it much easier to apply custom noise profiles to batches of images. Automatic lossless rotation of JPEGs from cameras with orientation sensors so that images are displayed the right way up in your image browser and editor. Automatic editing of IPTC/XMP data in Nikon NEF, Canon raw (CR2, CRW and TIF), TIFF and JPEG images. Use this feature to store copyright information and other information such as location data in your images right at the start of your workflow. IPTC templates can be prepared in advance and saved to disk for later use. Full integration with BreezeBrowser Pro. Downloader Pro can run BreezeBrowser Pro or be started from BreezeBrowser Pro. Automatic tagging of JPEGs with color profiles according to camera model. Many cameras can store images using different color spaces (e.g. sRGB or Adobe RGB) but they do not embed a color profile in the image. Downloader Pro can automatically embed a color profile in JPEGs as they are downloaded. If you use more than one camera you can specify different color profiles for different camera models. Automatic adjustment of dpi settings of JPEGs as they are downloaded. Most cameras set the JPEG resolution to a low setting like 180 dpi which is inconvenient and confusing when using image editors like Adobe Photoshop. These editors use the dpi setting to determine the print size of images (size in pixels / dpi = size in inches). Downloader Pro can automatically adjust the JPEG dpi to your preferred value (e.g. 300 dpi) as the images are downloaded. Flexible renaming to organize images already downloaded to your PC. Simply specify the source folder and use Downloader Pro to copy the images to a new location. Support for portable hard drives that copy your memory cards e.g. Delkin PicturePad, NixVue Vista, ImageBank etc. These devices are great for storing pictures when you are away from home and don’t want to take a laptop, but they can cause problems later. Every time you insert a memory card in these devices they take a complete copy of the card and so it is very easy to end up with duplicate images. Also digital cameras often create several folders of images on a memory card resulting in a vast number of folders to sift through when you get home. Downloader Pro can help with both problems: firstly by identifying duplicate images and only downloading each different image once and secondly by allowing you to specify the download path using the shooting data e.g. image capture date. Download directly from Canon EOS digital cameras: Canon EOS-1D C, 1D X, 1D Mark IV, 1D Mark III, 1Ds Mark III, 5DS R, 5DS, 5D Mark III, 5D Mark II, 7D Mark II, 7D, 70D, 60D, 50D, 40D, 30D, 100D/Rebel SL1, 1200D/Rebel T5, 1100D/Rebel T3, 1000D/Rebel XS, 760D/Rebel T6s, 750D/Rebel T6i, 700D/Rebel T5i, 650D/Rebel T4i, 600D/Rebel T3i, 550D/Rebel T2i, 500D/Rebel T1i, 450D/Rebel XSi or 400D/Rebel XTi. Also from many Canon PowerShot cameras including the PowerShot Pro1, G6, S2 IS, S70, S80, A520 and the Digital IXUS series. Backup plug-in to protect your images by making up to two backup copies of each images as it is downloaded. The backup plug-in now includes an option to backup all files, JPEGs only or non-JPEGs only. Ideal for professionals shooting raw+JPEG who want to copy JPEGs to a separate location for their client and keep the raw files for postprocessing. DNG Converter plug-in to automatically convert raw files to Adobe's DNG format (requires Adobe's free DNG Converter). Automatically synchronize the clock of your Canon camera with the clock on your PC. This makes it easy to ensure your camera is always set to the right time and avoid annoying problems like forgetting to change the clock when Daylight Saving Time ends. 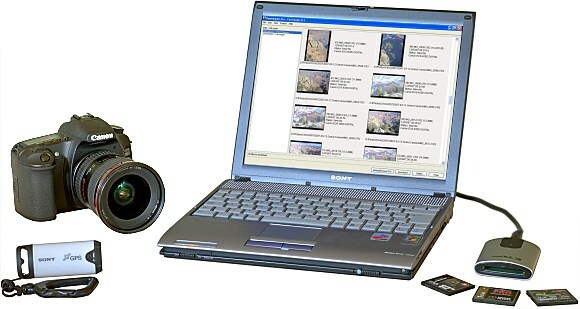 It can also be used to ensure the clocks on several cameras are all synchronized to the PC's time and date. Read sub-second timing from the shooting data when available making it possible to use the date and time to uniquely name images even when taking continuous sequences. Currently only Nikon digital SLRs store the sub-second timing in the shooting data. SDK (Software development kit) available for developing plug-ins for Downloader Pro. Plug-ins run on each image after it is downloaded and can be used to add extra functionality e.g. creating backups of downloaded images on a separate drive; calculating a secure checksum of images to prove that they haven’t been modified at a later date. These are just a few of the many features to be found in Downloader Pro. For full details please see the online help pages or better still, download the trial version and see for yourself how how our picture downloader will transform the way you handle your digital images. Downloader Pro supports any card reader or camera that is mounted as a Windows drive e.g. USB 1.1, USB 2.0, FireWire, PCMCIA and ImageBank Cardbus card readers, and portable hard drives such as Delkin PicturePad, NixVue Vista. It will also download directly from Canon EOS cameras and older Canon PowerShot cameras using the USB or FireWire interface. For best results we recommend using Downloader Pro with a USB 2.0 or FireWire card reader as this can be up to 20 times faster than downloading directly from the camera.